Pluto was first discovered in 1930 by Clyde W. Tombaugh at the Lowell Observatory in Flagstaff Arizona. 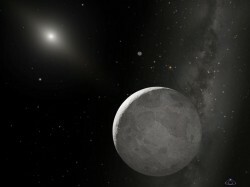 Astronomers had long predicted that there would be a ninth planet in the Solar System, which they called Planet X. Only 22 at the time, Tombaugh was given the laborious task of comparing photographic plates. These were two images of a region of the sky, taken two weeks apart. Any moving object, like an asteroid, comet or planet, would appear to jump from one photograph to the next.